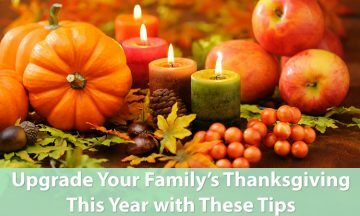 Upgrade Your Family’s Thanksgiving This Year With Just a Few Tips! Once Halloween has come and gone, it seems like the holiday spirit is truly upon us, and frankly, as much as we love it, it can leave any mom overwhelmed by trying to think up the perfect meal plans, vacations, etc. So, we reached out to lifestyle blogger and fellow mama Marlin Anderson to give us some of her tips for Thanksgiving this year to see if we can glean some creative inspiration and really knock Thanksgiving out of the park! Thanksgiving is the time of the year when we take a pause in our fast paced lives, acknowledge what God has given us, and pray for everyone’s happiness. More so, it gives us an opportunity to look inwards. However, in accordance with the changing human dynamics, Thanksgiving has acquired many more meanings altogether, and rightly so. It marks a great celebration to encourage a brotherly interaction among us as a society. It is indeed a true message of peace and happiness. Your celebrations should start by sending personalized and preferably printed thanksgiving invitations to your friends and family. (Editor’s note: If too late this Thanksgiving, keep in mind for next year!!) Writing emails or sending text messages is not going to create that warmth and excitement. So, it is always a nice way to get your guests excited with a DIY invitation. You can include your own imagination and creativity to prepare collective or individual cards for the people who you want as your invitees. Think of how you can express genuine gratitude, appreciation, and love through these invitation cards. It is really fun when a themed Holiday party is organized. Make sure to convince your guests to get dressed for the party’s selected theme. If you do not have any specific theme in your mind, just stalk Pinterest… Or for one that is always memorable, try a superhero theme where your guests come by donning their favorite superhero costumes. Children especially love the superhero theme. Another theme you can incorporate is “movies” such as Game of Thrones, Pirates of Caribbean, etc. where your guests will make their get-ups like their favorite characters. Then, of course the meals and décor can match, too! Whether you have organized your Thanksgiving party at your home or anywhere else, it needs a complete makeover with decoration (remember that theme!). You can purchase or borrow certain items from your family, friends or neighbors that are perfectly suitable, too. (If you really are bucking against a theme, think of at least upping the décor and go big on colors that complement the season such as orange, yellow, green and burgundy.) Items should be chosen in such a way that every piece of decoration should complement each other in accordance with the theme. If you have a modest budget for your Thanksgiving party, there is no need to get excessive with the décor, but live flowers and plants always add an elevated elegance. Without games and other engaging activities, there is usually no fun in a party. Since you want to make it a memorable event, think about various ideas to entertain your guests. You need to select games that are most appropriate for your invitees irrespective of their age. If most of your guests are kids, you should organize not one activity but many – they will love it. If your guests want to get up, move and become a little bit crazy, try Turkey hunt, Thanksgiving scavenger hunt, pumpkin roll, turkey bowling, Thanksgiving word scramble, and Thanksgiving treasure hunt to just name a few. Finally it’s time to feast! Your guests are tired and hungry now, so serve them food that they won’t forget for a long time with something a little different. Whether you are planning to serve traditional food or seasonal, just make these dishes a little more exotic. Whether the food is baked, buttery, creamy, candied or crisp, your Thanksgiving food could be plated really prettily, or it can just have a different flavor than normal (i.e. curry rubbed turkey). Think about serving signature cocktails to your guests, too, because nothing sets the tone for good conversation faster than a festive beverage. Cranberry champagne sangria or warm apple toddies anyone?? Thanksgiving is right around the corner, and yes, it might be fun to show off and plan a party to remember, but above all… make sure to enjoy the festivity yourself and with your nearest and dearest ones. So whether you are hosting the party at your home or renting out a venue, it’s time to make this rendezvous a really special one. Marlin Anderson is a housewife and loves to share her thoughts with other. She has two little (and cute) children. She loves to spend her time with her family. She also writes for Esprittoday.